Relax with a hassle-free shared transfer from your Sunshine Coast hotel to Brisbane Airport (BNE) and end your vacation or business trip stress-free. Transfers are available from holiday accommodations and private residences along the Sunshine Coast from Caloundra to Noosa. Ride with a professional driver in a comfortable shared minivan for an efficient and on-time transfer to Brisbane Airport's domestic and international terminals. Your professional driver provides efficient door-to-door service from your Sunshine Coast hotel or residence to Brisbane Airport (BNE). Simply pre-booking this shared minivan transfer and be ready with your luggage before the pre-arranged time. 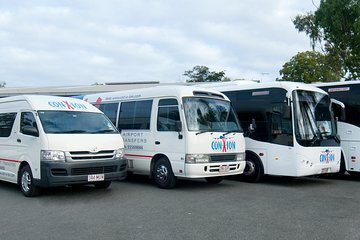 Transfer services operate daily, connecting with all flights departing from Brisbane Airport's international or domestic terminals. Board your minivan and stretch out with generous legroom and baggage storage. Ride to your flight in comfort and arrive at the airport in plenty of time to catch your flight. Pleasant drivers, pick up on time, all good except for AWFUL traffic near Brisbane. Great service. Thanx. Lovely lady @ office, very helpful. Friendly drivers, quick transfer @ Aussieworld. On time to be picked up, good timing @ Airport. Very pleased. The transfer was smooth, comfortable and very fluid, the trip was managed professionally. A great service and one that I would not hesitate to use again. This transfer involves changing buses their buses part way but our concern about any delay was unfounded and we arrived at the Brisbane International airport for checkin in lots of time. We would book it again. Picked up on time from my hotel and dropped at the airport with plenty of time to spare! I had to phone the Australian agent to find out at what time we'd be picked up 4:30 am, but had only made the booking the day before, on the weekend. The trip was good - collected at the hotel on time and delivered to the airport in good time. It's a very slick operation - changing buses at a main depot but with only a few minutes stopover there. Two disappointing things about this trip. The first was the issue organising pick up - there was no record in your system of us having a booking. As a result I was on the phone for quite some time and the booking reference that was printed on our ticket - as noted above was not in the system - quite frustrating.